Neurons in the primary visual cortex of an awake mouse. 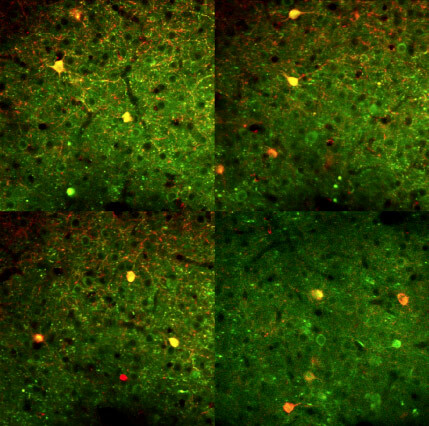 Neuroscientists from the Picower Institute for Learning and Memory uncover a fundamental discovery about cortical neurons, showing that inhibitory neuron functionality is not an immutable property of cortical cells, but a consequence of more complex network dynamics. Inhibitory neurons (interneurons) have long been recognized as critical to understanding distinct kinds of information processing. Specific subtypes of interneurons can regulate response gain (the extent of reaction to stimuli) in excitatory neurons or shape response selectivity in target cells. In a new study scheduled appearing December 11 in Nature Communications, Sami El-Boustani and Mriganka Sur of the Picower Institute for Learning and Memory hypothesize that a particular type of interneuron may influence responses in a context-dependent manner. 1 Comment on "Neuroscientists Reveal Fundamental Discovery about Cortical Neurons"
Not sure if this may prove to be a pro or con, but the fact that inhibitory function has been more closely identified is a plus regardless.